It was the type of weekend every player fantasizes about. The type where the money horses keep performing, everything keeps going right, and the competition just can’t keep up. For Pierre Poulin, it happened when the stakes were high. Poulin took advantage of an early afternoon qualifier to secure entry into Saturday’s $10,000 tournament, finishing third in the contest which featured early races from Saratoga and Monmouth Park. The qualifying contest, starting at 1pm and sporting a $29 entry fee for 28 players, awarded berths to the 4:30pm $10,000 contest to the top four finishers and provided an affordable opportunity to play for big money – an opportunity of which Poulin took full advantage. Armed with just a single entry into a contest which many players choose to contest with multiple entries, Poulin was forced to rely on his handicapping chops and a well-honed contest strategy in order to emerge with a big paycheck. He was already hot, and he had to stay hot. But picking winners wasn’t the ultimate key to victory. Indeed, Poulin astutely picked Bio Pro in the contest finale, annexing an additional $46.40 to his already swelled bankroll, but he hardly needed a windfall to vault him to the top of the leaderboard. Of the nine individuals that picked longshot Bio Pro, Poulin’s bank account was by far superior, securing him the win and a grand prize package worth $5,000, which included $4,525 cash and a $475 token for entry into the following day’s $5,000 High Roller Tournament. That $475 Token would prove to be the gift which kept on giving. In Sunday’s $5,000 High Roller Tournament, Poulin was brimming with the confidence that comes from having already won a high dollar tournament the day before. That confidence would only grow as Poulin struck early blood in the second race of the tournament, picking cap horse Dissention in the 8th race from Saratoga. 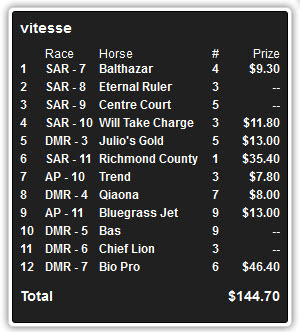 He was one of only two players to hit the $50 horse, enough to put them just a few dollars ahead of David Santoni (“chiliking”), who was the only player to have hit the $47.60 horse in the first leg. With a quarter of the field already well out in front, it changed the complexion of the game for everyone, including the early leaders. Unfortunately for the rest of the field, there would be no more bombs along the way. Poulin would finish off his closest competitors by selecting a pair of middle priced winners, although second place finisher William Ortega (‘bromosdad’) would put in a respectable late rally to clip the official margin of victory to just $3.50. Poulin’s winning share of the High Roller tournament was $4,000. 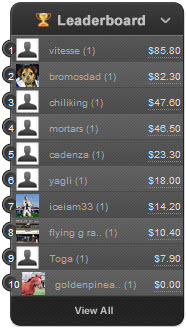 Ortega, the runner-up, took home the $1,000 consolation prize. Poulin started following horse racing in the early 1980’s and enjoys traveling to the country’s premier racing events, including the Breeders’ Cup and the Kentucky Derby. But in addition to the name attractions, he also quite enjoys boutique and novelty meets and tracks, such as Colonial Downs, Kentucky Downs and Ellis Park in addition to obvious hotspots such as Keeneland, Saratoga and Del Mar. 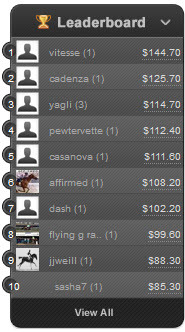 Poulin has been an active member of the DerbyWars community since its inception. His first trip to the National Handicapping Championship was last year and he hopes to qualify once again this year. He is also aiming for a chance to participate in the Breeders’ Cup Betting Challenge, a high-dollar live-money contest, for the first time. Professionally, Poulin is a money manager in equities and research analyst, which he somewhat jokingly equated to handicapping the races. Our customized cleaning service in tulsa maid service in addition to organizing aadaptability is sure too match any type of house or entrepreneur. notre Hay Day hack and outil trich! Hi friends, fastidious post and good urging commented here, I am genuinely enjoying by these. Notre outil de formateur unique va vous aider tre le meilleur joueur au Hay Day ! William Lombardo or my pine company team. Bouton, votre compte sera automatiquement accorde 999 999 pices et 999 999 diamants sans dpenser de l’argent grce l’algorithme hack. Il n’est pas ncessaire pour des privilges d’administrateur lors de ce processus d’installation se poursuit. Certains des hros sont extrmement puissants en pouvant vaincre une entire arme dans quelques secondes. 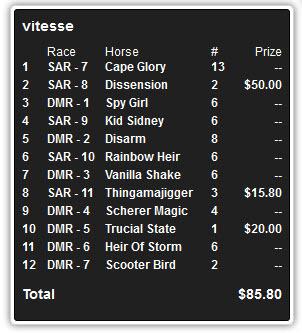 Thanks for finally talking about > Pierre Poulin Sweeps DerbyWars_ Weekend Tournaments | Derby Wars Blog < Liked it!